Use one tool to collaborate across teams, plan sprints, run scrums, and track work. IBM Track and Plan on Cloud includes templates for common processes such as SAFe, Scrum, and formal project management to help guide and enforce processes that ensure predictable results. Because not all projects or organizations are the same, you can configure process rules to meet specific team, project, or organizational needs. Using customizable views and dashboards, you can access information about multiple projects such as news and events, current build status, work in progress, and requested changes. You can see what other teammates are working on, and view their online status and availability. 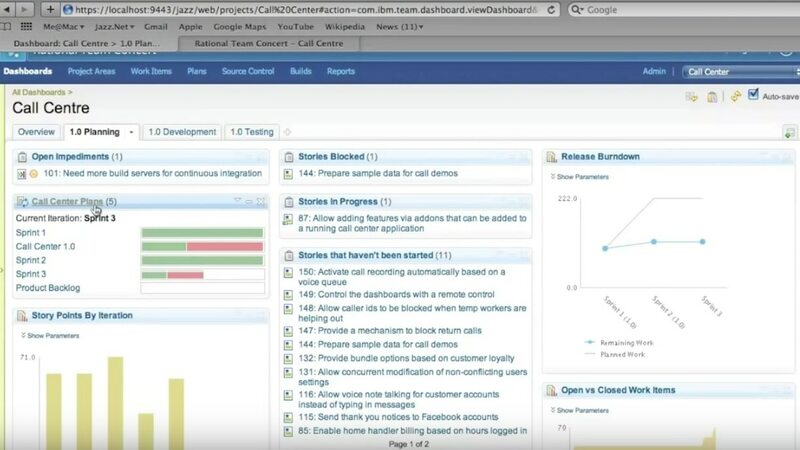 IBM Track and Plan for Cloud automatically creates and tracks the progress of individual work items according to the team process and project rules. Identified defects, enhancements and conversations can flow to multiple teams and projects. IBM configures Rational Team Concert in your single tenant secure environment so you can develop without the initial up front costs of traditional IT infrastructure. No hardware provisioning needed to begin exploring new ideas. Subscribe for as short as 1 month, and pay on a per user basis. You will need an internet browser and access to the internet. Machines require at least 4GB of RAM and an Intel Pentium 4 processor or equivalent.